A series of suspected bomb blasts has hit busy markets in India’s capital, Delhi. 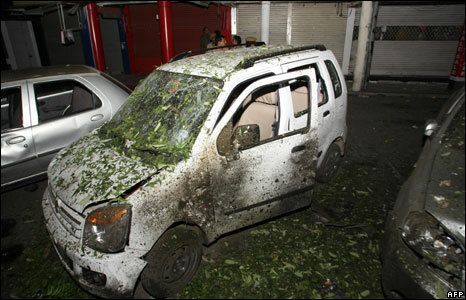 One of the blasts occurred in the Greater Kailash area in the south of the city. Victims of the blasts were soon arriving at nearby hospitals. Nearby property was badly damaged. 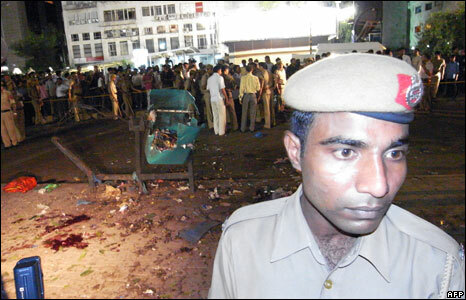 As police secured the scene, investigations into the cause of the blasts got underway. NEW DELHI, India (CNN) — A string of explosions ripped through busy marketplaces in New Delhi on Saturday, killing at least 15 people and injuring at least 50 others, a police spokesman said. People run to help an injured man after a bomb blast in a commercial area in New Delhi. CNN-IBN, CNN’s sister network in India, said it received an e-mail from the Indian Mujahadeen warning of an impending strike. The e-mail was received about five minutes after the first blast. At least five explosions ripped through the Karol Bagh market, Kailash Market and Connaught Place — a popular tourist destination, Delhi police spokesman Rajan Bhagat said. 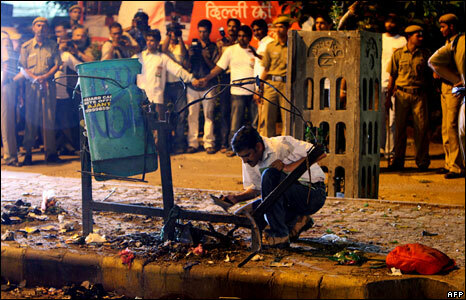 Two other bombs found near a movie theater and near central park in the Connaught Place area were defused, he said. 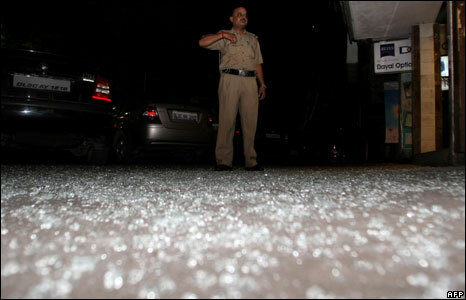 Bhagat refused comment about who might have carried out the attack. No arrests have been made, he said. Indian Mujahideen claimed responsibility for more than a dozen blasts that struck the western Indian city of Ahmedabad in July, killing 15 and wounded 100 others. The blasts struck within about an hour of each other within a six-mile (10 km) radius. Indian Mujahideen also claimed responsibility in May for near-simultaneous bomb attacks that killed 63 people in the northwest city of Jaipur. In the Jaipur claim, the group declared “open war” against India in retaliation for what it said were 60 years of Muslim persecution and the country’s support of United States’ policies. Oct 29, 2005: 50 people killed and 70 injured, including some foreigners, in three explosions in two busy markets and near a bus in Delhi. 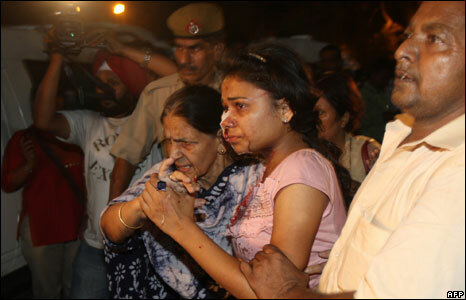 May 22, 2005: One person killed in serial blasts in two cinema halls in Delhi. Dec 30, 1997: Four commuters killed and about 30 injured in a bomb explosion in a bus near Punjabi Bagh. Nov 30, 1997: Twin blasts in Red Fort area leaves three killed and 70 injured. Oct 26, 1997: Twin bomb blasts in Karol Bagh market leaves one dead and 34 injured. Oct 18, 1997: One killed, 23 hurt in twin bomb blasts in Rani Bagh market. Oct 10, 1997: One killed, 16 injured in three bomb blasts at Shantivan, Kauria Pul and Kingsway Camp areas. Oct 1, 1997: Thirty injured in two bomb explosions near a procession in the Sadar Bazar area. Jan 9, 1997: 50 injured in bomb blast opposite the Delhi Police Headquarters at ITO. May 23, 1996: At least 16 people killed in bomb blasts in Lajpat Nagar Central Market.